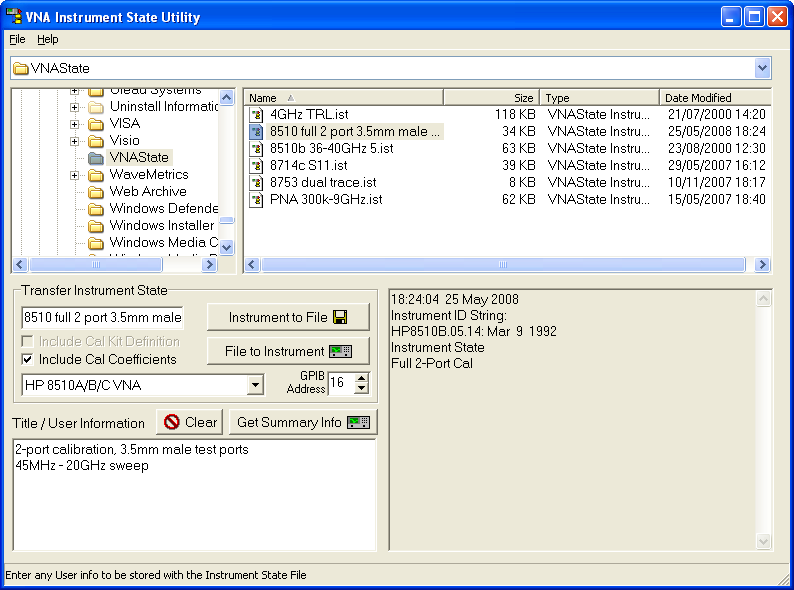 Many analyzers are shared between users, and this software enables each user to retain their own settings beyond the limits imposed by the number of stores within the instrument. Furthermore, it can be a productivity aid to be able to rapidly context-switch between measurement configurations. In the upper part of the program window, the drive, path and directory or folder can be selected. Any existing IST files will be shown in the file list. Then, in the Transfer Instrument State section, enter your chosen filename. Set the GPIB Address of the instrument and connect the instrument to the PC - Note you can click in the GPIB address box and then press F3 to pick from a list of all instruments detected on the GPIB bus. In the Title / User Information box, you can enter any text to help remind you what the instrument state data contains. This is stored along with the data and can be previewed before reloading the data back into the analyzer. To add the Start and Stop frequency and the number of sweep points from the analyzer into the information box, click on Get Summary Info. Apart from the configuration of the instrument, which is always transferred, there are separate data stores for the current calibration and the calibration kit definition. If you wish to store these too, make sure that these options (Include Cal Kit Definition and Include Cal Coefficients) are ticked (checked). Click on the button marked Instrument to File. This will complete the transfer of data to your selected filename, and it will then appear in the file list. In the upper part of the program window, the drive, path and directory or folder can be selected. Choose an IST file from the available selection in the file list by clicking on it. Double-Click the filename in the file list to preview its contents. If you specifically want to inhibit the transfer of Cal Kit data or Cal Coefficient data, un-tick (un-check) the options Include Cal Kit Definition or Include Cal Coefficients. If these items are not in the file being transferred, it does not matter whether they are ticked or not. Now click on the File to Instrument button to transfer the data to the instrument. You can download IST files from Windows Explorer by dragging and dropping them from the Explorer to the VNAState program window. If you double-click an IST filename (e.g. in Explorer or from an E-mail attachment), VNAState will run and preview the file contents. You may then click on the File to Instrument button to transfer the data to the instrument. VNAState requires a National Instruments GPIB card (or compatible) in order to connect to GPIB instruments. PC running Microsoft Windows 10, 8.1, 7, XP, Vista, 2000.
or an Agilent/Hewlett-Packard 82335, 82340 / 82341, 82350 or 82357 HP-IB interface.